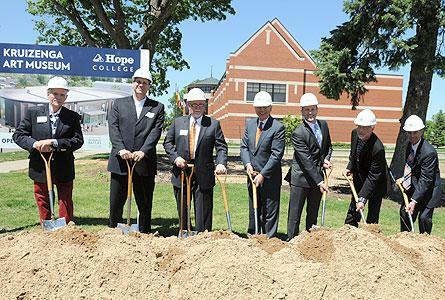 The groundbreaking celebration for the new Kruizenga Art Museum at Hope College emphasized the building’s role as a resource not just in one discipline, and not just for the campus, but across disciplines and for the entire Holland community and beyond. “My vision is that art museums should be lively places that bring people together. The phrase that I’ve settled on is that art museums should be a community convener,” said Dana Friis-Hansen, director of the Grand Rapids Art Museum, who was the featured speaker during a luncheon held in conjunction with the Friday, May 24, event. The Kruizenga Art Museum, scheduled for completion in 2015, will be built immediately northwest of the De Pree Art Center, for a total project cost of $5 million including construction and a maintenance endowment goal. The museum is being developed with an emphasis on engaging faculty and students from many academic disciplines in the study and interpretation of art, and envisioned as an educational resource not only for the college but for West Michigan. The museum is among the initiatives of the college’s “A Greater Hope” comprehensive campaign, announced in October 2011. It is being named in honor of a leadership gift from Dr. Richard and the late Margaret Kruizenga of Dallas, Texas, and Holland. The five blocks of Columbia Avenue between 13th and Eighth streets feature a variety of arts centers in addition to the Kruizenga Art Museum, which will be located on Columbia Avenue at 11th Street near the already-extant De Pree Art Center and gallery. The college’s Dow Center at the corner of Columbia and 13th Street houses studio space for the department of dance. The DeWitt Center and the college’s main theatre are on Columbia at 12th Street. The college’s new concert hall and music facility is planned for Columbia Avenue between 10th and Ninth streets, and the Holland Area Arts Council is near Columbia Avenue between Ninth and Eighth streets. In addition, the college’s Knickerbocker Theatre is located just a few doors away on Eighth Street between College and Columbia avenues, and the Holland Museum is a few blocks west on 10th Street between River and Central avenues. Holland Mayor Kurt Dykstra discussed the concept of “place-making”—of communities striving to distinguish themselves through unique and attractive features. The museum will provide exhibition space for the college’s extensive Permanent Collection as well as visiting exhibitions, with additional support for curation of the collection. It will complement the De Pree Art Center, which will continue to host exhibitions in addition to housing the offices and faculty and student studios of the department of art. The museum’s architect is Matt VanderBorgh of The Hague, The Netherlands, a 1984 Hope graduate who is director of C Concept Design, which has developed projects in 19 countries on four continents. Leadership guidance for advance programmatic planning has been provided by Donald Battjes, a 1968 Hope graduate from Los Angeles, Calif., who is retired from a career in corporate facilities and real estate administration, most recently as chief of operations and facility planning with the Los Angeles County Museum of Art. Work across the summer months will focus on the museum site, including transformation of the former 11th Street into a pedestrian walkway between Columbia and Lincoln avenues. Earlier in the week, the college removed Gringhuis and Sligh cottages, whose lots will be part of the art museum site.